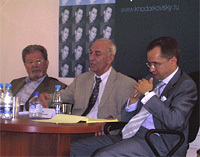 Task: In the situation of unprecedented state attack against the progressive entrepreneur maintain Mr. Khodorkovsky's positive image; ensure his and his lawyers' messages are communicated clearly and persuasively; win the international court of public opinion by demonstrating Khodorkovsky's innocence in incriminated activities; highlight the political nature of his prosecution. Strategy and tactics: The main tool employed from the very first days of the campaign was extensive media relations campaign enabling us to control the story and educate the journalists about the real nature of the case against Mr. Khodorkovsky. Throughout the trial of 2004-2005 and beyond it we have maintained a dedicated separately located and independent Press Centre office with equipment and communication facilities for court reporters and lawyers. On the daily basis we have worked with the international legal team to publicise their position and make it comprehensible to the general public. At the same time, we disseminated and popularised MBK’s political vision and ideas, created an MBK “brand”, enlisted third party supporters, organised stunts and special events. New www.khodorkovsky.ru info web-sites were launched and maintained, 24/7 bi-lingual hot-line, all kinds of media, including social networks and Internet TV, and tireless outreach activities have been instrumental to ensure success of the campaign. Result: From less than 10% in 2003 Mr. Khodorkovsky's support base rose up to 33% in 2013, his recognition and respect among Russian and international audiences are one of the highest among his peers. His web-site peak readership exceeded 250 000 unique visitors in the time of trial. 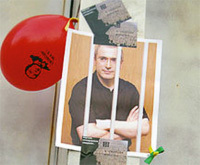 The true reasons for his imprisonment have been recognised by opinion leaders all over the world.